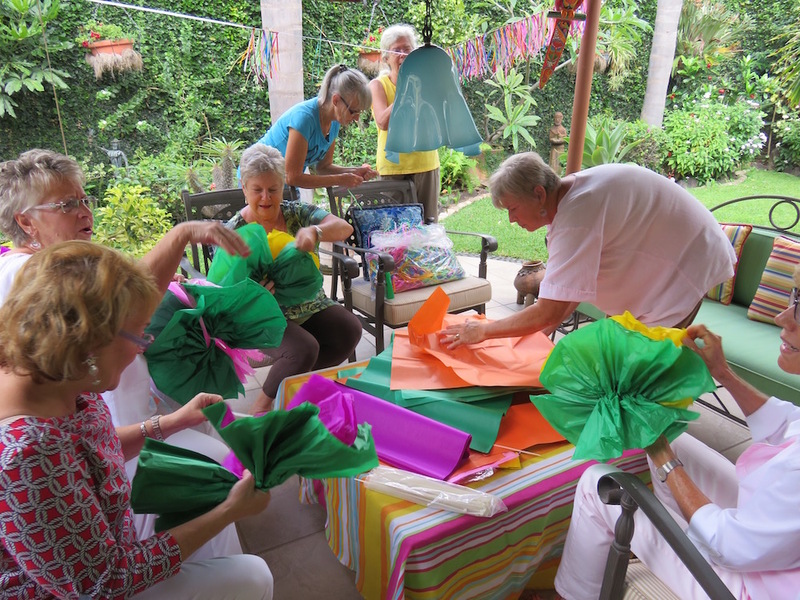 For the past 14 years, every year in November there is an event that brings the top artisans from all over Mexico to Lake Chapala for a three-day show. It is the Feria Maestros de Arte Mexican Folk and Indigenous Art Show. 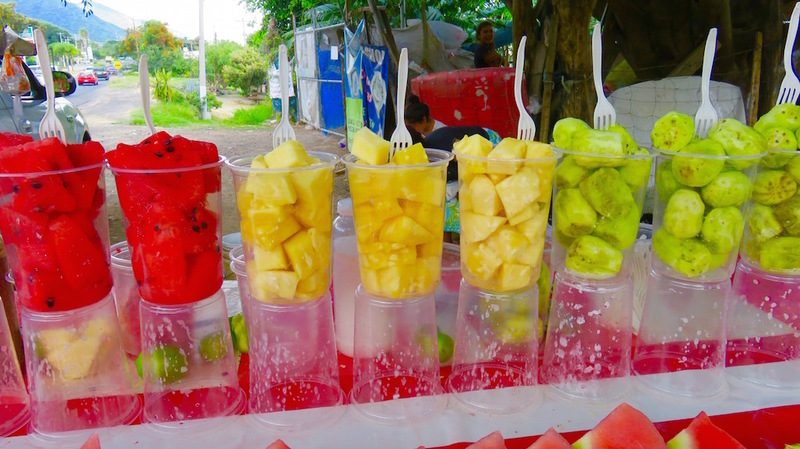 This year it will be November 13-15 at the Yacht Club in Chapala. Eighty artists will participate, along with music, dancers and other entertainment. The unique feature of this show is that it costs artists/artisans nothing to participate. 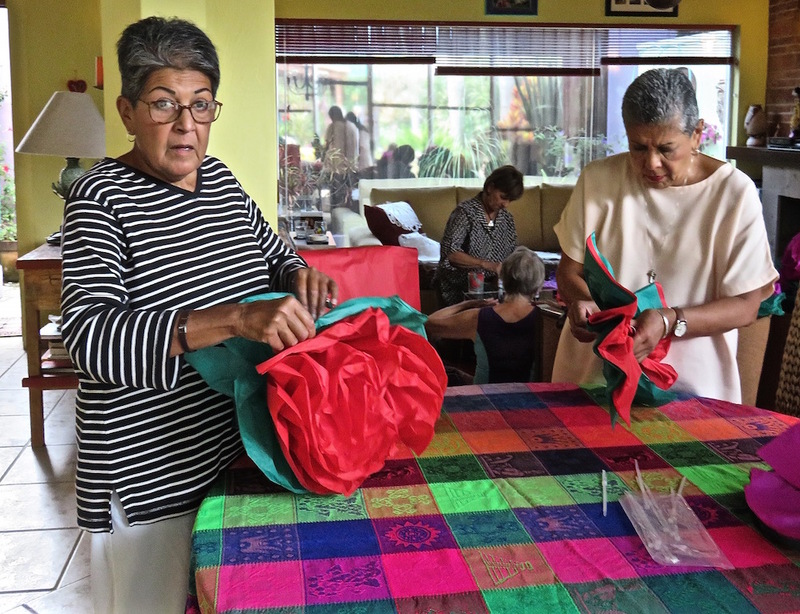 The Feria Committee, comprised of both Mexican and Ex-pat inhabitants of the Lake Chapala area, pay for transportation, shipping, accommodation and meals for all of the participants and their families. There are no booth fees or any other fees. For many of the artisans, the sales they make during these three days comprise their entire year’s salary. Others count it as their top show of the year as it draws thousands of not only local art lovers but also collectors and gallery owners from the U.S. and other countries. 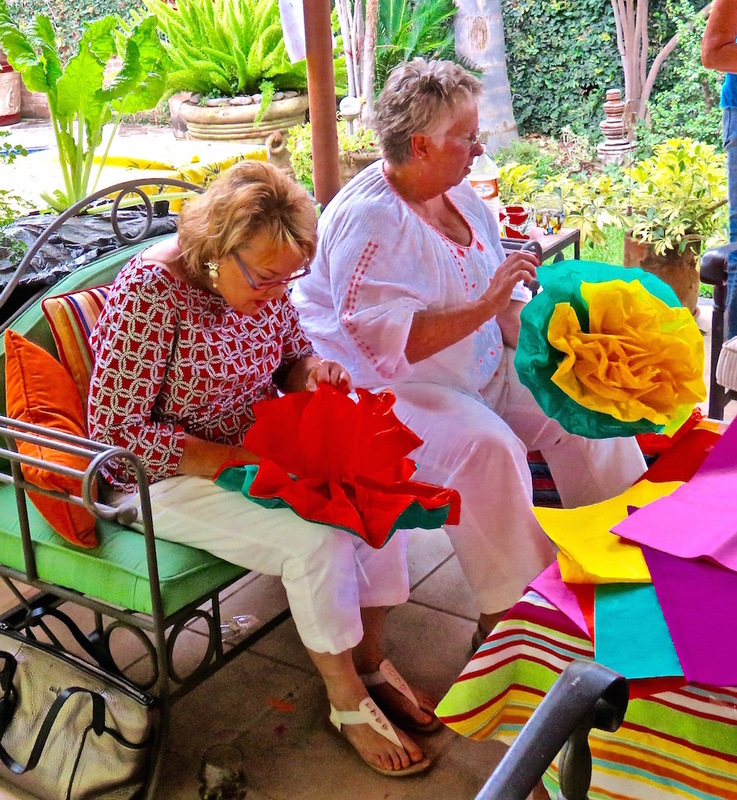 The Feria, which was the brainchild of Marianne Carlson, who last year handed over the reins but still acts as publicity director and board member and woman-of-all-jobs for the Feria, was conceived of in an attempt to allow artisans to continue to create their traditional homemade art: clothing, carpets, furniture, sculpture, toys, beadwork, paintings, pottery, paper making, jewelry, tapestries, rebozos, knives, glassware and photographs. With the decrease of tourism at various times, without this show, many of these artisans would have been driven to abandon their skilled artistry to take other jobs, which in many cases would mean the demise of an art form that they are one of the few artisans still making. 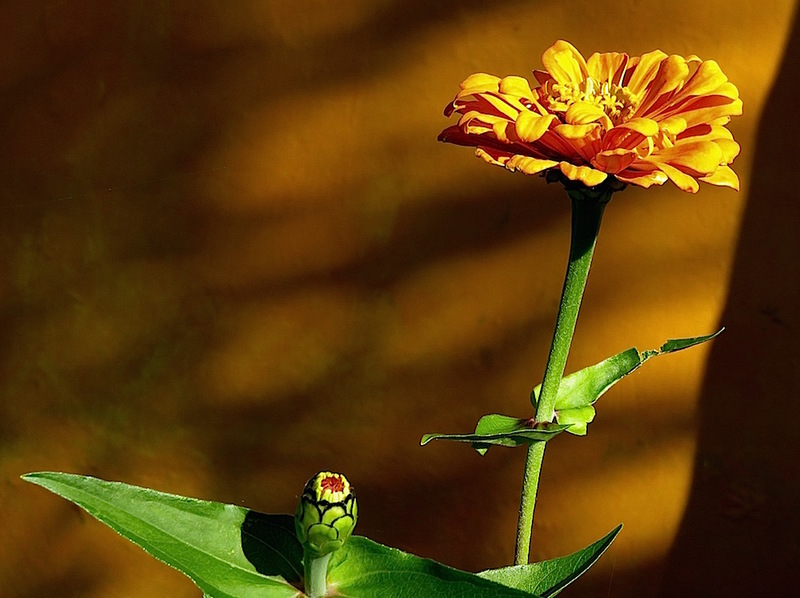 This entry was posted in Paper Flowers and tagged Images of paper flowers, Maestros del Arte images, Paper flowers on September 30, 2015 by lifelessons. It has gotten sort of intiguing to see how many times the same prompt will come around. This is #3 for this one. To see the poem “If Only I Could Play Guitar,” go HERE. Three hours slumber is not enough. I float the night in search of more. 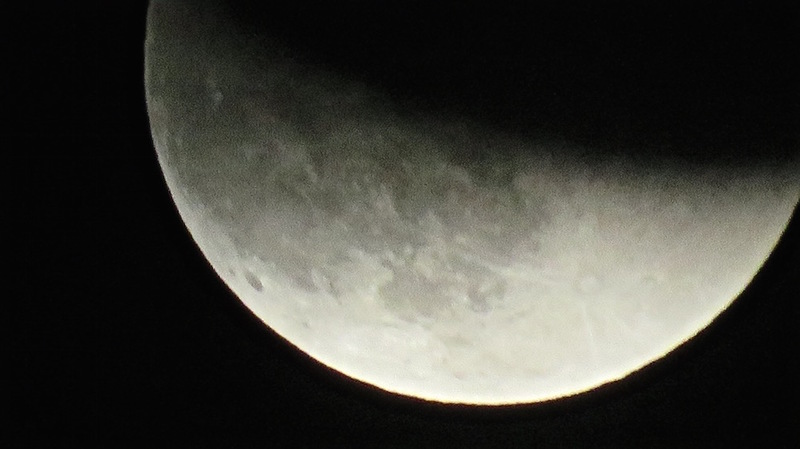 night’s shadow cusps the bloated moon. Its light invades my stubborn dream. I am awakened too soon, too soon. slices through my dream’s light gown. sees truth disrobed and writes it down. it may not be as it appears. 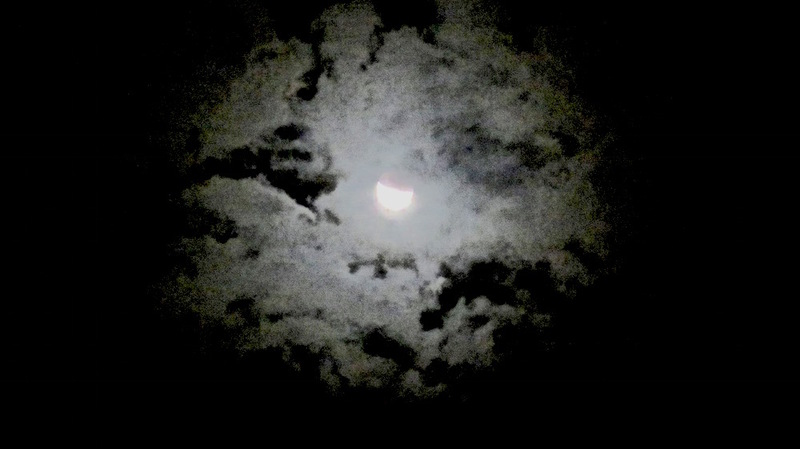 [1AM] Judy: Isn’t it weird how in my photograph, the clouds seemed to form a moon shape around the moon? This entry was posted in Uncategorized and tagged Dreams, Intuition, photos of the blood moon, photos of the eclipse, poem about the eclipse, poem about the moon, the moon on September 30, 2015 by lifelessons. On the road near San Juan Cosala. Hard to believe these colors are real!!! 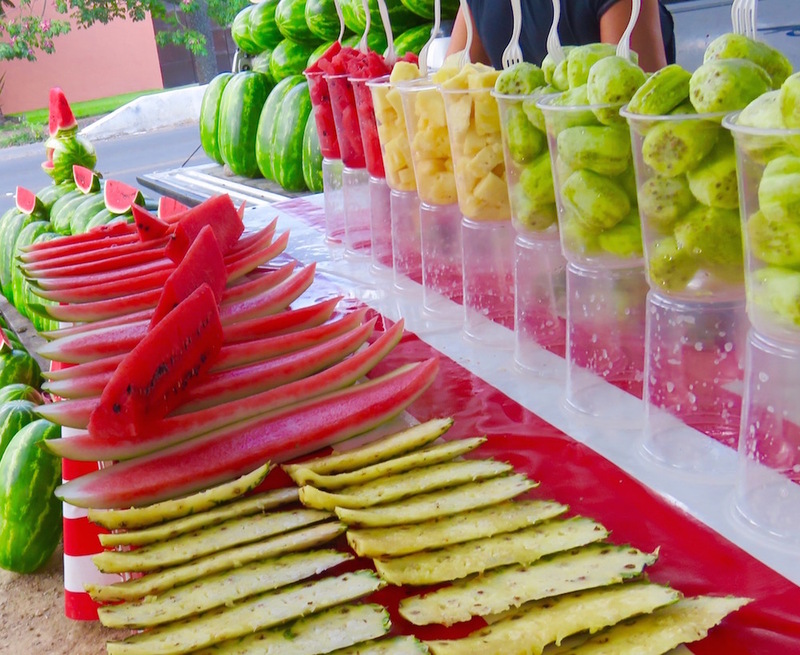 And, hard to admit I don’t like watermelon. 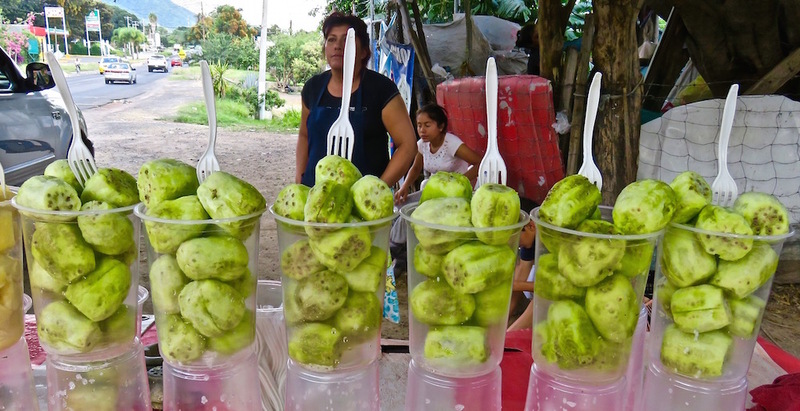 The green fruit is guava. This entry was posted in Uncategorized on September 29, 2015 by lifelessons. In response to The Daily Post’s writing prompt: “Life’s a Candy Store.” You are a 6 year old again How would you plan a perfect day? 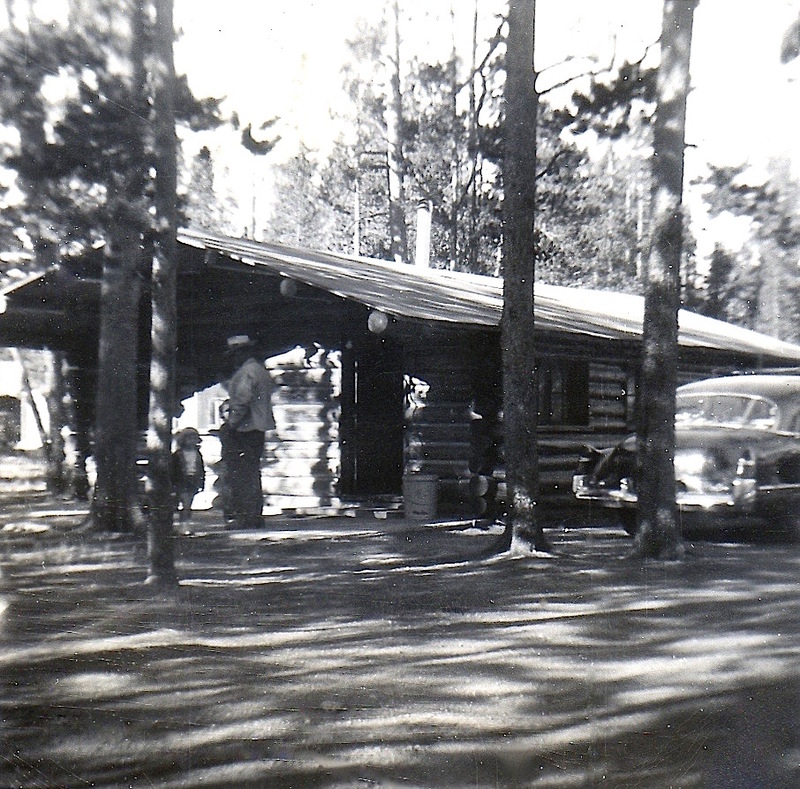 My dad and I at the Deer Huts when I was about 3. 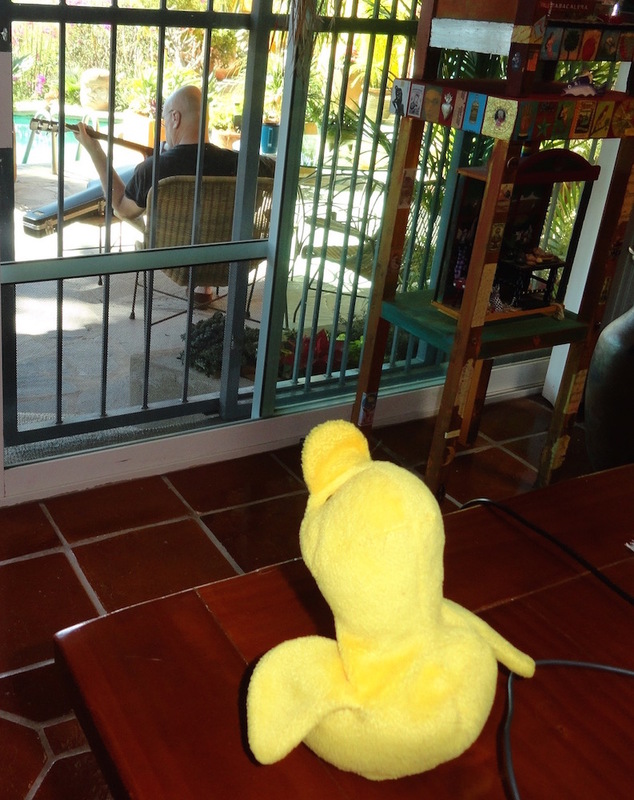 My dad is coming with us–he doesn’t have to work. Corn muffins in the oven, and coffee on the perk. It’s orange juice for sis and me. I take a little sip. We woke up really early to start out on a trip. We’re going to the Black Hills where we will spend the night. We’ll start out just as soon as we have had a little bite. They’ve let me plan the whole long day, so nothing will go wrong. then drive on through the Badlands, as dry as any bone. to give our stomachs all a lurch and a little flutter. My mom will say “Oh Ben!” and then my older sis will mutter. an action nixed first by my sis and then by my mother. buy rose quartz and mica and other rock chips rare. to ride on giant turtles and view other reptiles. We stop next at the Cosmos where gravity’s gone amuck. We’re doing everything I wish. I can’t believe my luck! On to old Rockerville Ghost town where we have our dinner. but with a scoop of ice cream it really is delicious. Just try to keep it from me–I’m likely to turn vicious! passing over and over and thrilling three small girls. We’re going to see Mt. Rushmore–those giant perfect faces. Perhaps we’ll buy a souvenir if we’re in Dad’s good graces. Then on to drive Custer State park with the begging burros. We’ve saved some treats from Rushmore–some peanuts and some churros. Back to Rockerville we go for supper and a show. as he ties the heroine to the railroad track. though mother doesn’t like it, and she makes a funny face. and we have to use the outhouse to take our bedtime pees. through the ponderosas, where perchance we’ll meet a bear! being extra careful to avoid stumbles and falls. of all the things my parents have let us do today. We both agree that this has been a perfect sort of day. 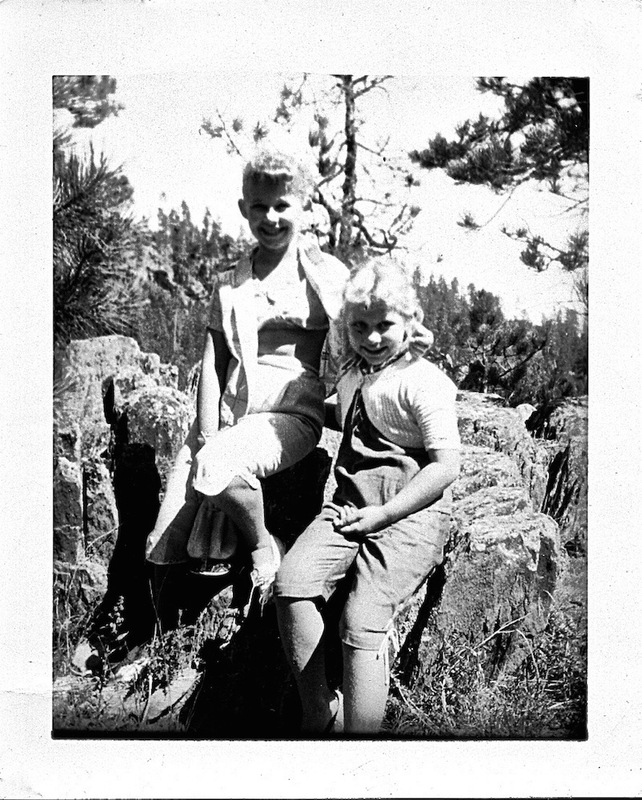 My sister Patti and I in the Black Hills, age 7 and 11. In South Dakota, lunch was dinner and dinner was supper. For the sake of authenticity, I’ve maintained the custom in this description of a child’s perfect day. Zealous Zinnias Just when you think all these ladies have left the dance, several pop up in a different place!. 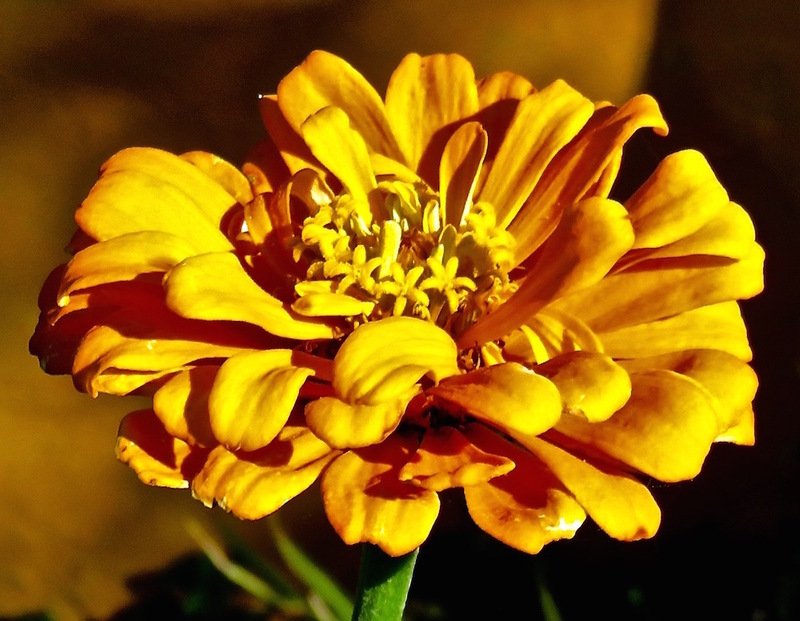 This entry was posted in Flower images, Flowers, flowers of Mexico and tagged Cee's Flower of the day challenge, images of zinnias, zinnia, zinnia image on September 29, 2015 by lifelessons. When my camera conked out in Wyoming, I stopped at Best Buy to buy a new one, then realized I needed a spare battery. Thinking it would be cheaper on the internet, I decided to wait, but I quickly learned the battery for this very new model was not available online. Researching camera stores on Google, I discovered that one of only two camera stores remaining in Wyoming was in Casper, which we were due to travel through on our route to Cheyenne. When we found it, there were three members of the military being served so as I wandered the shop–basically one long counter, I found this retablo, I had to photograph it. How better to worship at the shrine of photography? When it was finally my turn, I asked why there were so few camera stores in Wyoming and received an answer I should have guessed. The internet and large chain stores such as Best Buys and Costco had made dedicated camera stores obsolete. I was very grateful to have found this one. I was also pleased to find that these rechargeable batteries last at least 5 times longer than the batteries in my old camera. 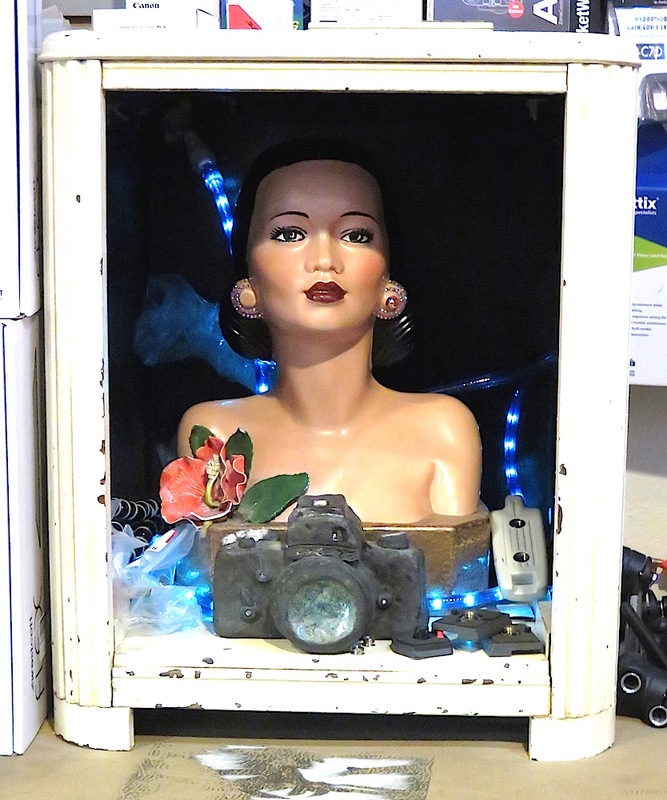 This entry was posted in Cee's Fun Photo Challenge, Judy Dykstra-Brown photos, photos and tagged camera stores, Cee's Fun Photo Challenge, Judy Dykstra-Brown Photos, Retablos, shrine on September 29, 2015 by lifelessons.